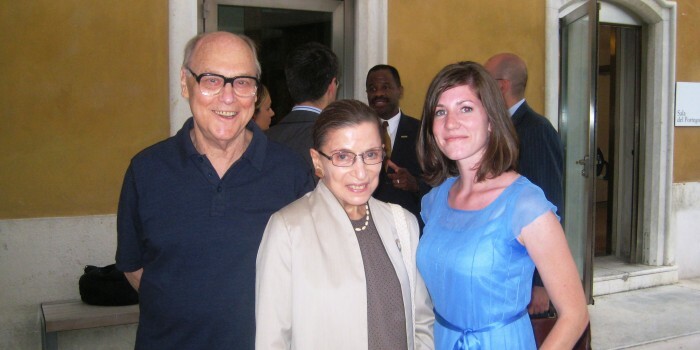 Martin Ginsburg and U.S. Supreme Court Justice Ruth Bader Ginsburg pose with Erin Hartnett ('10) at a reception during part of the Venice Study Abroad Program in 2008. U.S. Supreme Court Justice Ruth Bader Ginsburg will be a guest lecturer during the Wake Forest University School of Law’s Venice and Vienna Study Abroad Programs in the summer of 2012. “We are thrilled that Justice Ginsburg has so graciously agreed to once again share her expertise with our students in our study abroad programs,” said Dean Blake D. Morant. Justice Ginsburg will visit the law school’s Venice program the week of July 9 and guest lecture in several classes. She will give a public lecture entitled, “A Decent Respect to the Opinion of [Human]kind: the Value of a Comparative Perspective in Constitutional Adjudication.” It will be given on the evening of Wednesday, July 11, at the Palazzo Cavalli. The lecture is free and open to the public. Following her visit to Venice, Justice Ginsburg will then head to the law school’s Vienna Study Abroad Program, where she will guest lecture in several classes and give another public lecture on the same topic as the one she gave in Venice. The associate justice has a long history with Wake Forest law school. In May, Ginsburg gave the keynote address at a luncheon celebrating the kick off of the law school’s Program in Washington, D.C., which was held at the offices of Morgan, Lewis & Bockius LLP. In 2008, Executive Associate Dean for Academic Affairs Suzanne Reynolds co-taught a comparative constitutional law class in Venice with Ginsburg, who served as a guest teacher as part of the law school’s study abroad program. Her late husband, Georgetown University Professor of Law Martin Ginsburg, also taught in the 2008 Venice Summer Abroad Program with Professor Joel Newman. In 2005, Ginsburg visited Wake Forest as part of the law school’s “A Conversation With …” series, which brings speakers to campus to tell their stories. Reynolds interviewed Ginsburg about her life and career. Ginsburg was the second woman to serve on the high court. She was appointed by President Bill Clinton in 1993.